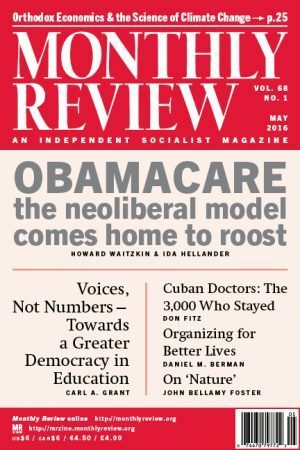 A little less than two years ago, in July-August 2014, Monthly Review published a special summer issue under the title Surveillance Capitalism, edited by John Mage. The contributors included such important analysts as Rishab Bailey, Beatrice Edwards, John Bellamy Foster, Robert W. McChesney, Alfred W. McCoy, Jean-Claude Paye, David H. Price, Prabir Purkayastha, Lauren Regan, and Michael E. Tigar. The lead article by Foster and McChesney was itself entitled “Surveillance Capitalism: Monopoly-Finance Capital, the Military-Industrial Complex, and the Digital Age.” In Foster and McChesney’s analysis, the problem of surplus absorption under monopoly capital was seen as having led to the development over the last seven decades of a massive surveillance network, extending across the sales effort, finance, and the military, and integral to the entire information economy. We were therefore pleased to discover that the concept of “surveillance capitalism” has now entered the mainstream and is drawing considerable attention, through the work of Shoshana Zuboff, emeritus professor at the Harvard Business School. Zuboff first took up the issue in a 2015 article in the Journal of Information Technology, entitled “Big Other: Surveillance Capitalism and the Prospects of an Information Civilization,” where she pointed to “the new logic of accumulation of what I call surveillance capitalism.” She failed, however, to mention the prior treatment of “surveillance capitalism” in Monthly Review, despite the fact that her analysis was written in November 2014—judging by her accessing of numerous articles on the Internet on that date—four months after the MR issue was published and posted online. In a March 27, 2016, article in the Frankfurter Allgemeine, entitled “The Secrets of Surveillance Capitalism,” Zuboff again writes of “what I call ‘surveillance capitalism,'” while still neglecting to give even bare mention to MR‘s previous, more developed treatment of this same concept nearly two years before. MR readers interested in the different approaches to the question of surveillance capitalism may want to look at a short exploratory piece by S.C. Hickman, entitled “Capital Behaviors: The Subtle Art of Tyranny,” published on socialecologies.wordpress.com, on March 10, 2016. Hickman places Zuboff’s recent discussion against the backdrop of the history and theory of surveillance capitalism provided by Foster and McChesney’s article in Monthly Review. What Hickman’s analysis implicitly suggests—if only by a general falling off of his analysis when turning to Zuboff and other establishment thinkers—is that somehow in the movement from radical critique (MR) to hegemonic discussion (Frankfurter Allgemeine), the left roots of these ideas, and many of their broader, more revolutionary implications, were simply discarded. Hickman focuses in particular on Foster and McChesney’s understanding of “securitization” as a ubiquitous concept emerging simultaneously in commercial, digital, financial, military, and legal contexts. 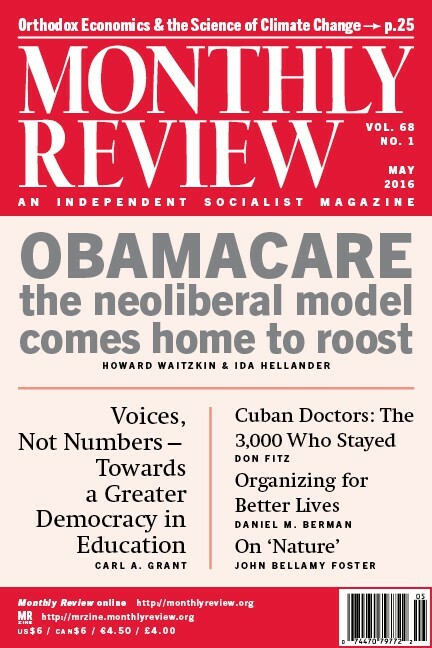 Monthly Review Press continues to bring out major works on all aspects of the crisis of capitalist society and the long-term global movement toward socialism. Our recent and forthcoming books include Samir Amin, The Reawakening of the Arab World; Steven Cushion, A Hidden History of the Cuban Revolution; Henry A. Giroux, America’s Addiction to Terrorism; Gerald Horne, Confronting Black Jacobins, Michael A, Lebowitz, The Socialist Imperative; Leo Panitch and Gregory Albo, eds., Socialist Register 2016: The Politics of the Right; Polly Pattullo, Your Time Is Done Now; Marc Pilsuk and Jennifer Rountree, The Hidden Structure of Violence; Sheila Rowbotham, Friends of Alice Wheeldon; Laurence H. Shoup, Wall Street’s Think Tank; John Smith, Imperialism in the Twenty-First Century; and John Tully, Crooked Deals and Broken Treaties. Yet it is a sign of a general revival of socialist thought that Monthly Review Press is not the only publisher bringing out important left books. We would especially like to single out the Historical Materialism book series, launched in 2002 and published by Brill with the cooperation of the journal Historical Materialism. Books in the Brill Historical Materialism series are brought out first in hardback at library prices, and then are published in paperback a year or two later by Haymarket Books in Chicago, which has emerged as a major left publisher. The Brill Historical Materialism series specializes in the publication of scholarly works aimed largely at the academy, but which are nevertheless extremely important for the development of theory and often have long-term significance with respect to practice. In 2015, the 100th book in the series was released: Marx’s Economic Manuscript of 1864-1865, edited and introduced by economist Fred Moseley and translated by Ben Fowkes, who previously translated all three volumes of Capital in the Penguin editions. It was this manuscript, never before available in English, that Engels used to edit what would come to be known as the third volume of Capital. Moseley has written a masterful introduction to the work, in which he argues, contrary to Michael Heinrich (author of the MR Press book An Introduction to the Three Volumes of Karl Marx’s Capital) that Marx’s Economic Manuscripts of 1864-1865 is not to be regarded as a wholly different work than Capital, vol. 3, as edited by Engels. Nevertheless, there are numerous isolated passages that are somewhat different, or that were excluded, as well as differences in organization. Those interested in Marx’s tendential law of the falling rate of profit especially, will discover that the arrangement in Marx’s original text raises all sorts of new issues, as Heinrich in particular has emphasized. The appearance of this volume in English is thus a major event. The 115th volume in the Historical Materialism series is John Bellamy Foster and Paul Burkett, Marx and the Earth: An Anti-Critique (2016). In their new work, Foster and Burkett expand on their earlier analysis of Marx’s ecology—in Marx’s Ecology and Marx and Nature, respectively—in response to recent ecosocialist criticisms of Marx. They explore the relation of Marx’s thought to such issues as thermodynamics, intrinsic value, and an aesthetics-based ecological critique. Responding to the growth of interest in socialism in the United States arising from the Sanders electoral campaign, MR editor John Bellamy Foster contributed an article for the Washington Post‘s online In Theory series on March 23, 2016, entitled “Is Democratic Socialism the American Dream?” (http://washingtonpost.com/news/in-theory).